Don't be frightened. I turned out alright... Right? 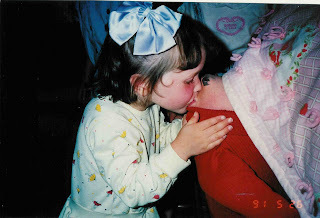 So Melissa's blog has all these pictures of her and Aaron as a baby. And Melissa has this idea that she was the cutest Snyder baby. You might not hear her say it on an everyday basis, but pull out the scrapbooks and the pride is just oozing. The worst part about it is that my mom completely agrees. She will be like, "Well Melissa does have that golden blonde hair and ...blah...blah" At least that is all I hear because I zone out- on purpose. But Melissa is out of the state, giving me access to all the photo albums. My mom, my grandma, and I were talking about my mom's wedding on Sunday. This is always a sensitive topic because my mom's wedding was not what we call perfect, romantic, best day of your life material. It included her getting ready by herself at the church house, her dad's girlfriend spray painting the milk canisters a metallic silver, and holding her veil in many of the pictures outside the temple. Nevertheless the day passed and luckily they have had plenty of awesome days to make up for the big day. 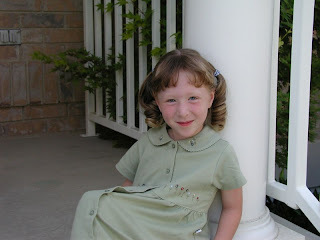 Anywho, I started looking at pictures from my parent's wedding and then little darling Emily. 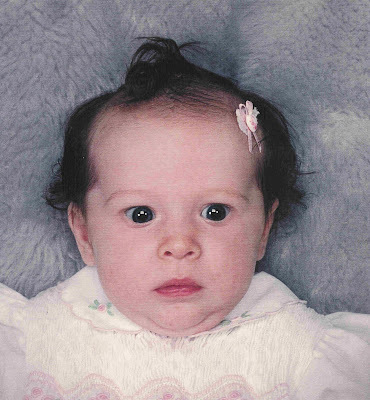 I don't know if it is because we look identical... but there are so so many cute pictures of Emily. I wish I had scanned them so I could include them, but one is of Em when she was three with her nose crammed into a blossom on a tree. When I showed present day Emily, she said, "Hey that is what the song says to do!" Thanks for the great illustration. And chunky little Jesseboy. What a doll. I think he wins the cutest Snyder baby award because his cheeks were so adorable. There are some great ones I must scan and send to him in Puerto Rico. 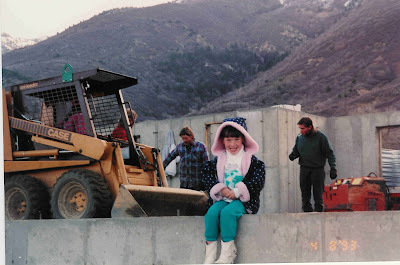 my first picture in Alpine, notice the darling white boots that my dad threw away because supposedly I wore them too much. Yes- many tears. Anyway- now skip Melissa, and you have me! So I think that even though I am not pregnant or anything, I would still like to take this opportunity to reminisce in my awesomeness- thus figure 1 above. Last summer after my first family history course, I planned on digitizing a lot of my mom's records from her remembrance book. Did it happen? Of course not. I was too family-historied out to teach my class that had such great attendance :(. So the goal for this summer is to scan a lot of these old family photos (even though I am not in most of them because this was practically in the dark ages :)- it makes it ok to say that if I put a smiley face, it is like saying something bad about someone and saying bless her heart). So get excited for cool posts in the future with vintage photography. Oh wait there is no tribute to Lizzy and we don't want her to be left out. Fast forward a few years in our lives. Lizzy was born! And luckily we have her to entertain us and swing on the swings, and keep us updated with Hannah Montana and the Jonas Brothers, and pigs, and the cute boys in 6th grade. Especially one that starts with a D.... ha that is all I will say. i LOVE, LOVE, LOVE, LOVE it!!!!!!!!!!!!! You Snyder girls...I can't help but laugh out loud whenever I read what you have to say...you must get it from your mother!!! SO glad you started a blog Becca!!!! I'll be sure to check back often! ok, it is SO true. I really am the favorite. I think my beautiful blonde hair only is the beginning of where the love originates. sigh. i know, you wish you were me. 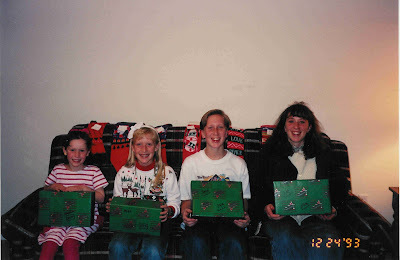 I think it's b/c as a child i was ignored, you know, being the middle. well, it's MY time now. and I love that my ship has finally set sail. :) hA! LOTS OF LOVE TO YOU. you're crazy. keep the memories flowing.